Hard basalt rock under the Port Hills, near Lyttelton, may have compounded the effect of Tuesday’s earthquake by reflecting more seismic activity back at Christchurch. Like sound waves, seismic waves can be reflected, absorbed or dispersed, with hard surfaces reflecting them. Being reflected back towards the city in this way might also explain why there are such marked differences in devastation – some areas would have been hit by worse waves than others. 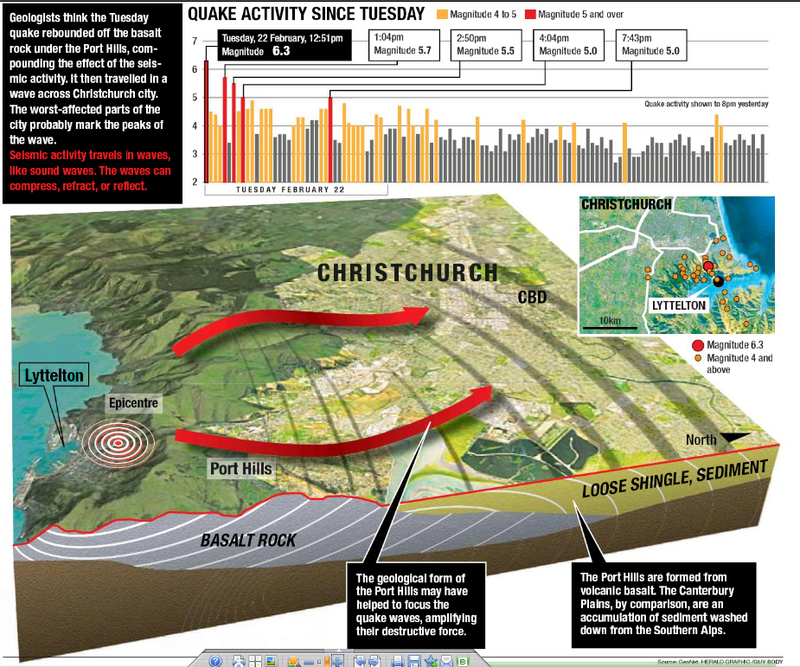 The New Zealand Herald has produced an infographic looking at the quake’s activity since Tuesday, and explaining what might have happened. An accompanying article, in which GNS Science geologist Hamish Campbell explains the idea more fully, can be found here.